Mounting wildfires near Pollock Pines and near Bass Lake are forcing residents to leave what they have behind and evacuate the areas. Three miles north east of Pollock Pines, the King Fire that started on Saturday afternoon has devoured 3,900 acres and was only 10% contained as of Monday. The area consists of brush and trees, which makes for plenty of fuel to maintain the fires intensity. CBS Sacramento reported that mandatory evacuations were initiated for the Estates at Forebay Road between King of the Mountain Road and Pony Express Trail, as well as all of Whites Meadows Road. Moreover, voluntary evacuations advisories have been issued for 133 homes in other nearby communities. On Sunday, a fire broke out near a foothill community south of the entrance to Yosemite National Park, prompting authorities to evacuate about 1,000 residents out of about 400 homes. So far, the fire damaged or destroyed 21 structures while it is only 20% contained. 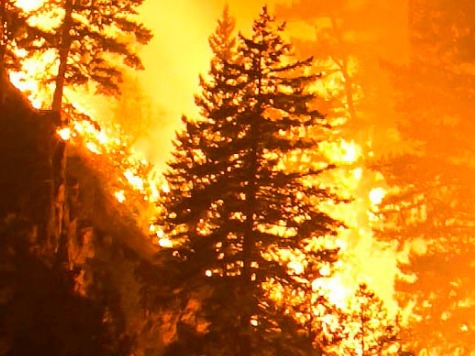 The Lake Bass fire made life miserable for vacationers enjoying recreational activities where searing fires have burned 320 acres so far and only 40% of the fire is contained. Stumps on the beaches near a picnic area were smoldering, and white sands were turning charcoal black from the flames.